Flying over the coast of Nova Scotia heading towards Newfoundland. Louise informs me this is the Bay of Fundy where there is a huge tide - The biggest in the world. 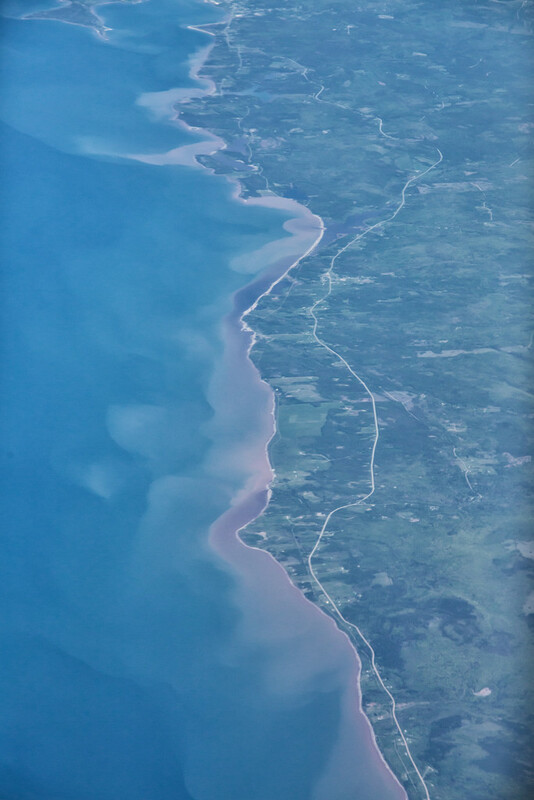 You can tell by the red muddy sand along the coast line and the red mud can be seen right along the rivers. We had clear skies all the way giving us a wonderful view of the landscape. Many thanks for your great comments on our Cinnamon bun shots from yesterday. I can confirm they are just as good the next day!! It was great fun that Pam and I sat in front & behind one another, so we could talk and take lots of photos! I love seeing things I can recognize, and this 9:15 AM photo shows close to high tide. 'twould be fascinating to additionally see it at low time! Perhaps when we return in a week! I love seeing and sharing planescapes, Pam! I have been to the Bay of Fundy and the tides are amazing. This is lovely. I agree with @joemuli , it does look like a beautiful watercolor picture. You are on your way on yet another adventure! You go girls!!! Lovely! Ooh, my brother went there. I heard it's amazing. That's very interesting. Much of northwest Australia has huge tides too. Beautiful view from the plane. Lovelyl photo. So you and Louise are off to Newfoundland. Where that great movie was made -The Shipping News' That will be great to see!